All our hardware is in metric and has been converted to American measurement. Variances may occur due to the manufacturing process. It is important not to pre-bore for pulls as the center-to-center dimension may vary slightly from our catalog. 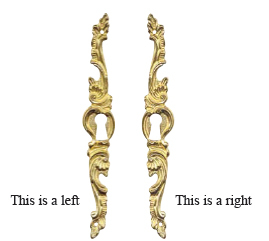 European Hardware and Finishes is the largest importer and manufacturer of European iron and brass period hardware. Many of our clients do their own finishes on our hardware, however we also have many clients who want to purchase hardware with our special finishes. For this reason we offer an assortment of old world finishes custom made here at our facility. See pages V-VI-VII for our custom finishes. Our finishes are NOT sprayed or painted on unless a clear coat (lacquer) is requested or required. Each piece is enhanced individually therefore adding character to your hardware. Our distressing process used to create an antique finish on iron or brass makes each piece unique. Some finishes may continue to change. Finishes are not guaranteed. Some iron hardware is available in euro pewter. This treatment integrates zinc particles at very high temperature on the steel surface. This helps retard the rusting process. Most of our hinges are handed. When ordering please specify left or right handing. See diagram below. Our knobs, pulls and false keys fasten to wood with 4mm machine screws. We supply you with 1" screws for 3/4" wood thickness. If you need longer screws let us know the thickness of the wood used and we will provide you with the proper size needed. We also offer a breakaway screw that breaks down to various lengths. Pre-boring is not recommended. Most of our escutcheons are handed and are sold in pairs.